Do you want to explore Mexico, or even another country's culture but can’t travel there yet? You don’t need to be anywhere other than where you are to connect to the world you want to live in. This week you can explore Mexico, or any country for that matter, and learn all about the lives and get opinions of the people who live there, directly from the people who live there, whether your dream is Mexico City or Tuscany. You will learn more about that given country than your friends will even if they have spent thousands of dollars on trips. You will speak your second language more than than they will even if they are sitting in a restaurant in that country right now. At least three times a week I have 60-90 minute Spanish/English language exchange sessions with people who live in Pamplona, Seville, Valencia and Madrid, Spain. During these exchanges, I learn more about their country and their beliefs than I ever did on any of my three trips my trips to Spain, where I was lucky if I even shared a meal with a Spaniard. Some weeks I speak more Spanish with them online than I do living in Mexico. That more people don’t take advantage of the wonderful relationships you can establish via Skype language exchange websites astounds me. I have been practicing Spanish with the same four people in Spain for over two years, and have had numerous fascinating Skype conversations with people from throughout Latin America over the last several years. What I’ve learned goes far beyond any trip I’ve ever taken. All of my Spanish practice partners have invited me to visit, one even offering access to a second home for a month. All of the interesting conversations I had grew out of relationships facilitated by a “mandatory” once-a-week Spanish exchange practice schedule. Just like how you make friends at work because of the regularity of your interaction, you become friends as well as study partners through your language exchanges. One friend, Lourdes. is a vivacious single woman living in Seville with her 6’4’ son (I told her they didn’t make them that tall when I lived there in the 80’s. She agreed it was a relatively new phenomenon). We dish on men and dating. I learned the attraction of Irish men. She learned about Tinder (She was shocked.). I have learned that Spanish women have come a long way since my days in Valencia as a college student. She taught me about Spanish kings and queens….and a pretty racy lot they were, too. On the other end of the spectrum, my practice partner from Seville is a singer, graphic artist and psychologist with three children who grew up with parents who lived under Franco’s dictatorship. Her freedom in the free-wheeling post-Franco years was difficult for her parents to get used to, much like the American sixties. Another practice partner explained to me that in Spain, the government pays for the fruits and vegetables in schools lunches and the parents pay for the rest. Many a conversation has left me wondering and angry that America has no interest in how other countries have solved these problems. My practice-partner friend Javier lives in Pamplona. We talk about politics and existential things, made more interesting because he is an atheist (a Spanish atheist!). Naturally, the political situation in the U.S is garnering a good bit of interest and amusement abroad. When the conversation turned to our own populist trends and I expressed my confusion, he helped me understand populist movements by describing a conversation he’d had with an old friend of his, a nationalist Basque. As he explained, “I asked my friend [the Basque], “How can you believe that? That isn’t even logical!” The Basque answered, “But that’s what’s in my heart.” I couldn't understand someone being illogical, Javier told me, but I could understand someone acting out something in their heart. Do you think I would have had any of these conversations during a three-week vacation to Spain? Nope, in the three trips I never got beyond small talk and casual observations about one another's country. One of the things that my language partners like to learn about is what’s going on in technology, which does tend to happen in the U.S. first. The stories I find for them online are usually too long for someone for whom English is a second language so I cut and paste the most vivid paragraphs of stories about virtual reality, bots, or things related to the evolution of sharing services. Scenes from Semana Santa in Seville, Spain 2016. You might get a kick out of listening to them bash South Americans (They're charming maybe for the first hour and they swear a lot, I'm told), the English (They mumble), Germans and of course, the French ("They are just very rude"). I may send a story, like the one about the octopus who escaped a zoo and made his way back to the ocean. I don’t think Europeans spend as much time surfing the web as we do, which gives me a strong advantage. Unlike ever before, with web-cam services like Skype and Zoom people of any age, income or even health status can explore what life is like in other countries from the perspective of people living there. You will be surprised how many misconceptions you have, probably based on something you read or an experience you had in that country a decade ago. Your second language skills will improve too. Here are the best sites for finding a language exchange partner if you are over 40. My Language Exchange is my favorite because they have a lot of members over 50 and if you sign up, they don't automatically bill you every month. They send a notice at the end of the month, telling you your membership is about to expire. If you have enough partners, you don't have to remember to drop the membership. Too nervous about approaching potential practice partners online? If a shy housewife in Sevilla can, so can you. My book on Spanish will give you some tips to being and getting the best practice partners. Related link: Skype, even from the beginning, was a great time. The key is finding a little chemistry. Next up: A two country existence have provided even more methods to try to cure my insomnia, particularly when my home base is in Colorado. I'm already up to 32. 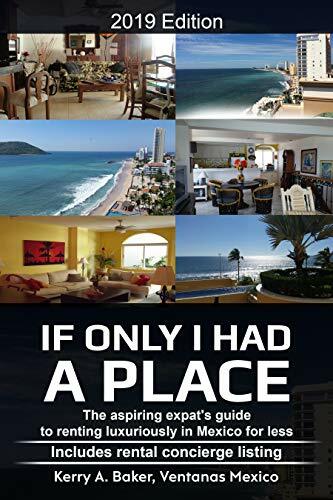 Hola, I am a partner with Ventanas Mexico which provides insight and resources to people considering expat life in Mexico, and recently wrote "If Only I had a Place" on renting luxuriously in Mexico. Renting in Mexico is different. Set up for your expat life right by learning the cultural implications of renting in Mexico. Book includes listing of rental concierges to help you confirm what you're getting is as represented. I am also author of the "Interactive Guide to Learning Spanish Free Online," a curation of the best Spanish language tools on the web. Take the book's direct links to the tools that Google Ads doesn't want you to know about, the unheralded sites and site features that beat anything you 'd pay for. Should Expats Have to File Taxes?